I am a big fan of Top Chef. I am always curious to see how the cheftestants manage their post Top Chef lives. Just by observation it is very easy to quickly identify the chefs that love the spotlight and those who would rather have their food speak for them. I am not saying one type is better than the other. Just different. Chef Casey Thompson is in the second group. She was Season 3’s Fan favorite and finished in the top 3. But post-Top Chef she took her time figuring out her next step. I have a really good friend who has a really good friend that is really good friends with Casey. I know. That is a lot of degrees. But having that connection allowed me to keep up a with what Casey was doing. She is a Texas native but has made Napa her home. She has spent the last several years honing her craft out there in the wine country and like good wine, it is worth the wait. Casey partnered with the Hotel Warwick in San Francisco for her restaurant. It is right across the street from Curran Theatre, a perfect spot for an established theatre crowd. But the decision wasn’t just a “yes” and she moved in. Nope. 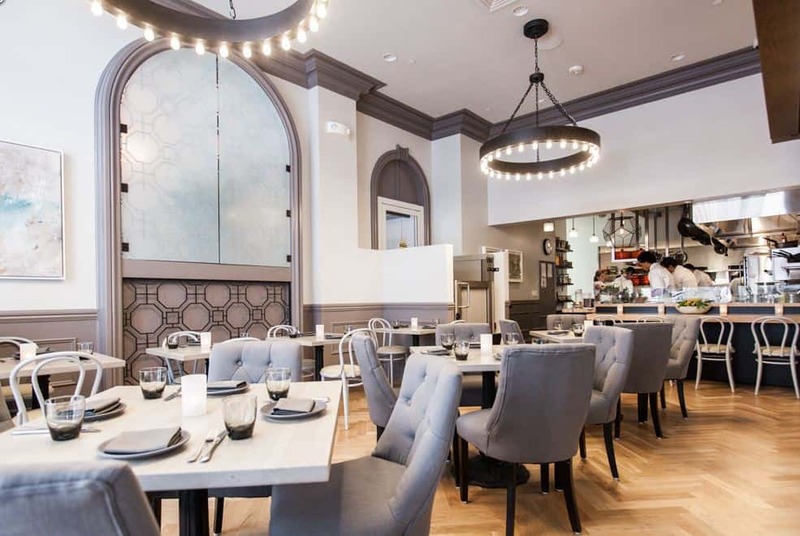 Her new restaurant, Aveline (the name a combo of Casey’s 2 grandmothers names) was a very long time coming. The restaurant is actually a former convenience store that was next door to the hotel. The creation of the restaurant was part of a very large renovation that Hotel Warwick undertook which included the fabulous bar, just relaunched as well, The European. Casey created the food for both venues. And two weeks after Aveline opened, my friend (who is friends with the friends who’s friends with Casey, you still with me?) and I had dinner to check it out. We started in the bar which is absolutely gorgeous. The drink menu is very cool. Really great European classics with modern twists. I didn’t eat anything but I had serious menu envy and I want to go back just for the bar bites. 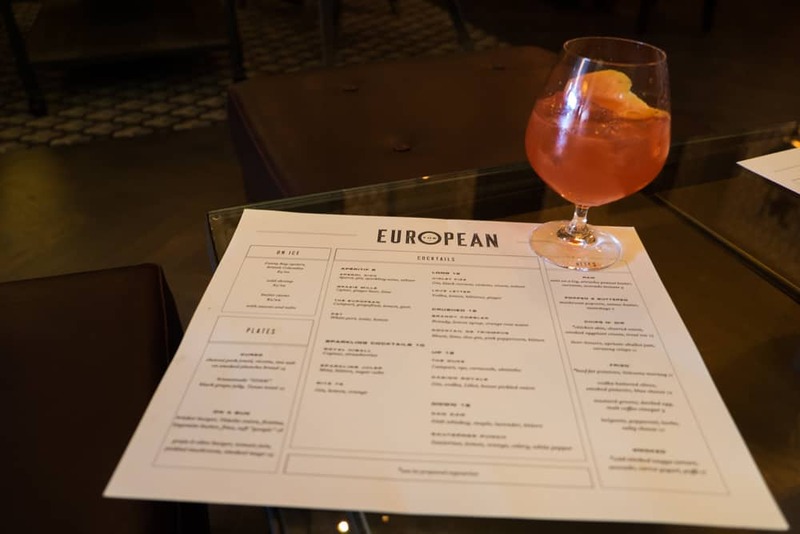 I had the bar’s namesake The European which is Campari, grapefruit, lemon and seltzer – delish! Having just come back from Italy, it was perfect. We moved to Aveline which is next door through the beautifully redone Hotel Warwick lobby. We sat down, ordered a glass of wine and perused the menu. We decided right away that we were all-in. Three courses, two palate cleaners and dessert! 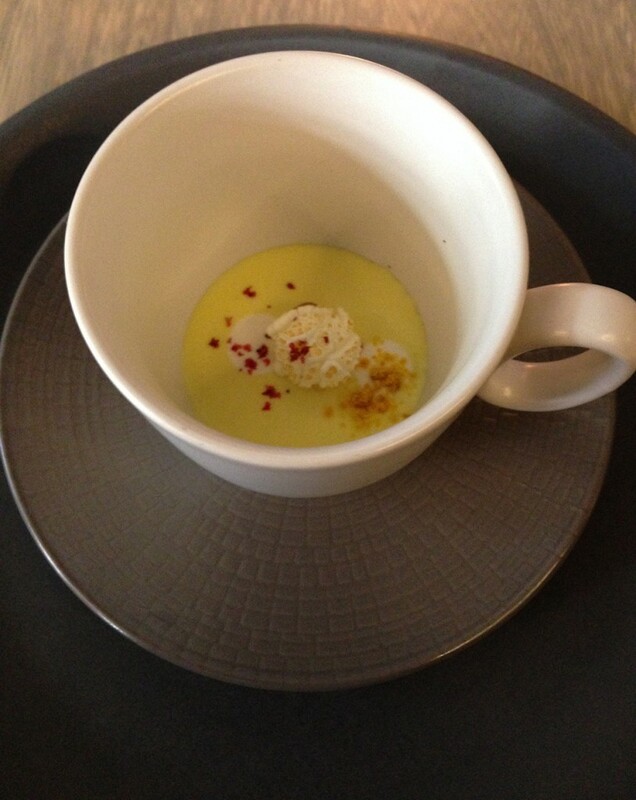 An amuse bouche of really light corn soup. It had a perfectly popped piece of popcorn on it as a garnish. The meal started and we had goat’s milk custard with tiny cucumbers, strawberry, black tahini and trout roe. The first palette cleanse was ricotta sorbet with peach and mint. 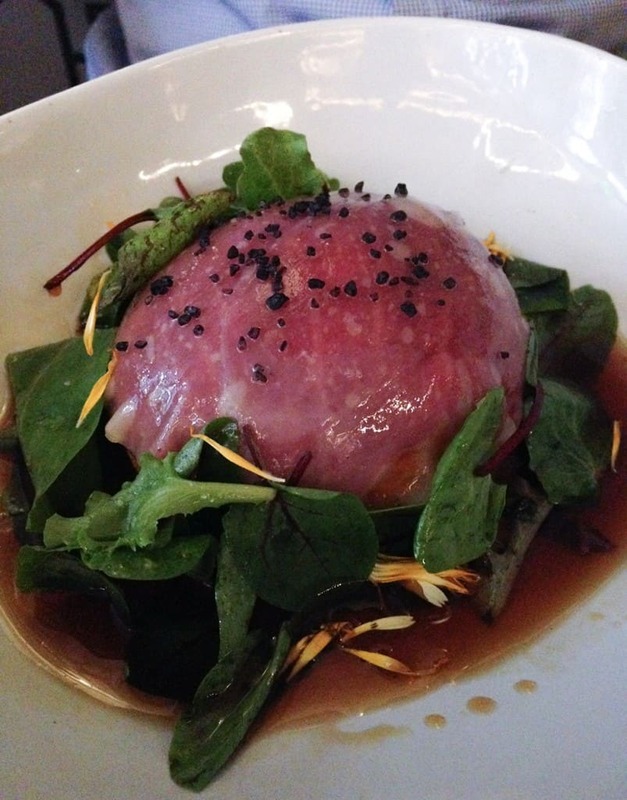 Then came a yolk beignet – very interesting – with wagyu beef, lardo and trotter sauce. When you cut into it, there was a perfectly cooked egg inside (and you know how I feel about eggs!). The second (and final) palette cleanser was lemon meringue on a cucumber granita. We watched Chef Casey at work between courses. 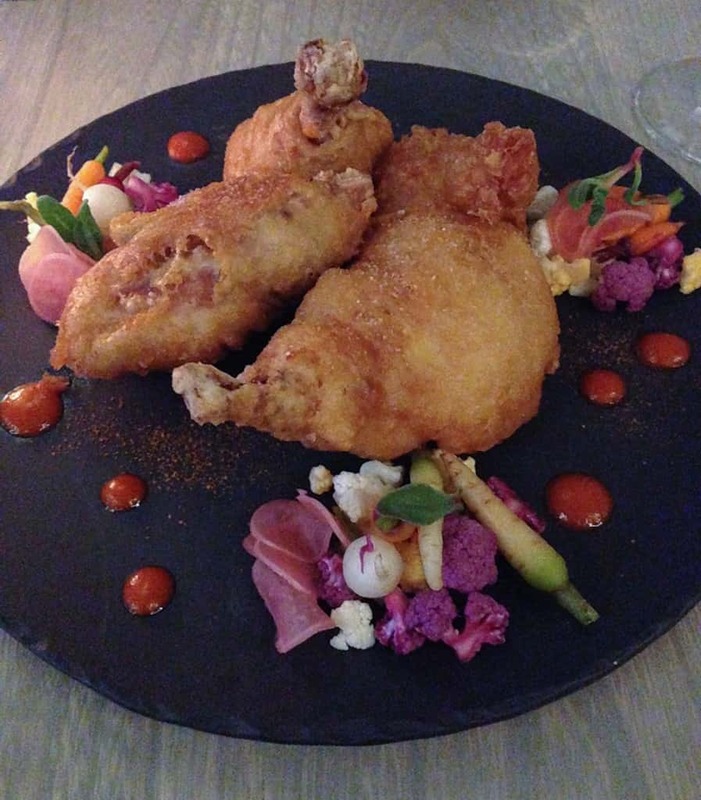 Lastly came fried chicken with kimchi powder, pickled vegetables and red pepper. We also had Campagnelle pasta with pig cheek, smoked yogurt and cracklin, it was getting too dark and the dish was monotone white so we skipped it! For dessert we shared a really fun dish called Batter which was a dark chocolate (batter), cashews and hazelnut dust served in a big mixing bowl with a big wooden spoon. Just like Mom used to do! I tried a photo with flash so that I could try to capture they whimsical nature. This was before we started eating. 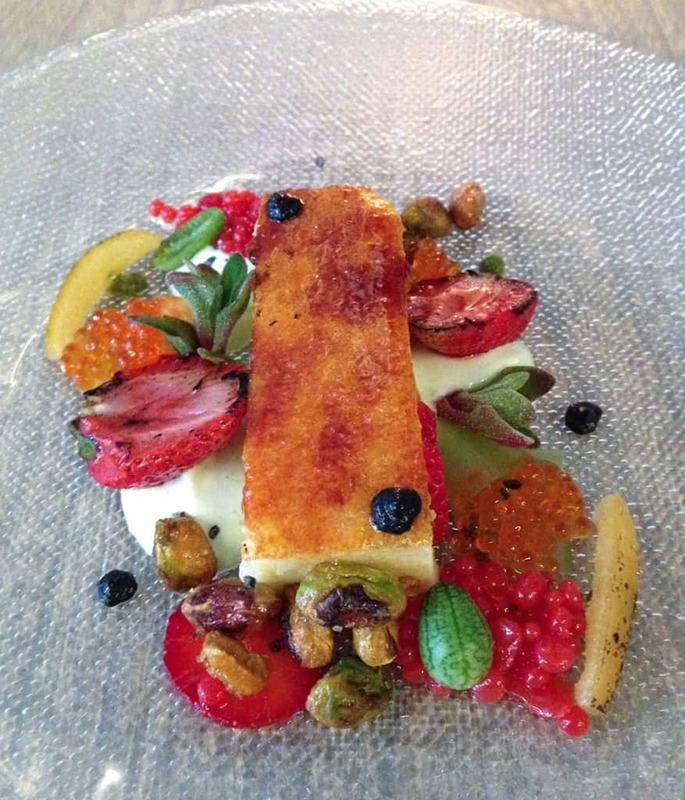 The desserts are designed by Kaley Laird who Casey met in the Napa area. Casey’s sous-chef is Blake Askew who she worked with in her Texas days. Together they make a powerhouse team! The meal was really good. A few things I didn’t love, but overall really delicious. Two weeks into any restaurant opening and there is still some working out of the kinks, so I am anxious to go back and eat there again if for nothing else, I must have those crab cakes again. I think Casey’s patience and planning has paid off. Her debut restaurant is going to be a huge success. I don’t know Casey personally, but I feel awfully darn proud of her! 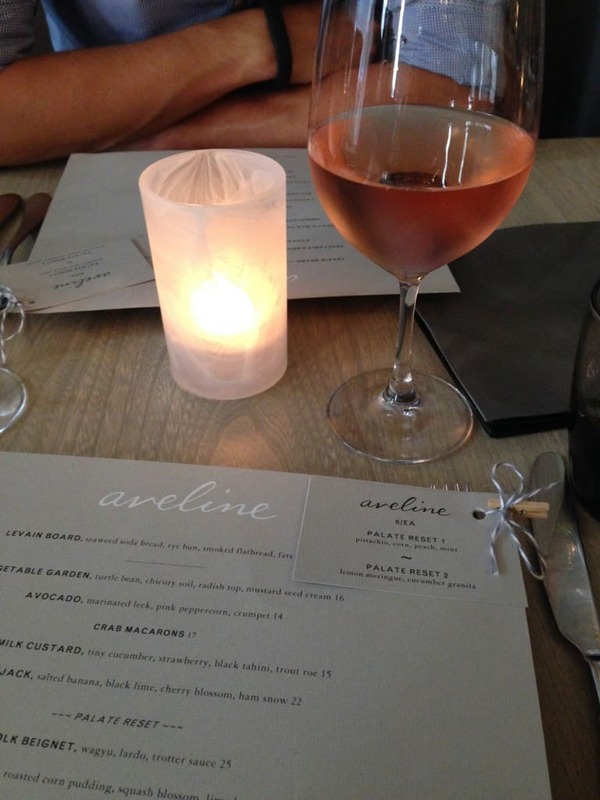 You too must try Aveline! It is in the Union Square area right across from the Curran Theatre, definitely put this on your places to eat if you are visiting San Francisco. Natives, you need to knock it off the list, check it out at least once, but I am sure you will go back more often! How about you? Have you eaten in a Top Chef restaurant? What do you think about my meal? Was there something that sticks out that you must try when you visit? Do tell! I love the history behind the restaurant. What lovely food!!! The more I read your blog, the more I’m sure I belong in northern California. (When I can’t be in Europe, that is.) 😉 Love the decor of that restaurant and the menu looks incredible!! @Katie, I was really impressed and you should move here! The decor is beautiful. The food doesn’t look bad either :). This was a dinner years in the making! I can’t wait to go back too and insist we check out bar bites next! That place is beautiful! And the food looks delicious! Wow wow wow! I love the decor of the place, but most importantly, I love how delicious everything looks! The goat’s milk custard is so colourful and appetizing! @Jenn, Casey is very creative, her food is very interesting to look at even before you eat it! Oh my gosh, that food looks De-LISH! I’ve only been to San Francisco once, but if I ever go again, I’m definitely looking up Aveline!! @Sharon, where did you visit while you were here? Great post and amazing photos. The food looks fantastic. The wonderful thing about living in NorCal is the fresh foods and wine. Great job! @Tammi, so lucky and blessed, this region is incredible! oh my! this looks amazing! I’ll definitely have to try it! Gorgeous and delicious looking. I love SF! We love Top Chef. I think it is so cool you went to Casey’s restaurant. @Karissa, I have been to a couple of Top Chef places, this is one of my favs. @Lindsay, it is a beautiful space. THIS IS SUCH A COOL OPPORTUNITY! THAT FOOD LOOKS AMAZING! Mouth-watering looking food, I love the look of that sorbet to cleanse the palette. Wow. What a great review! I too am a fan of the show AND of food in general and while San Francisco is a long ways away for me right now, this review has made sure I won’t soon forget this restaurant. I’ll be sure to stop in when I make it to the area! @Carolann, where are you at? There are Top Chef chefs all over, a lot of them with restaurants! 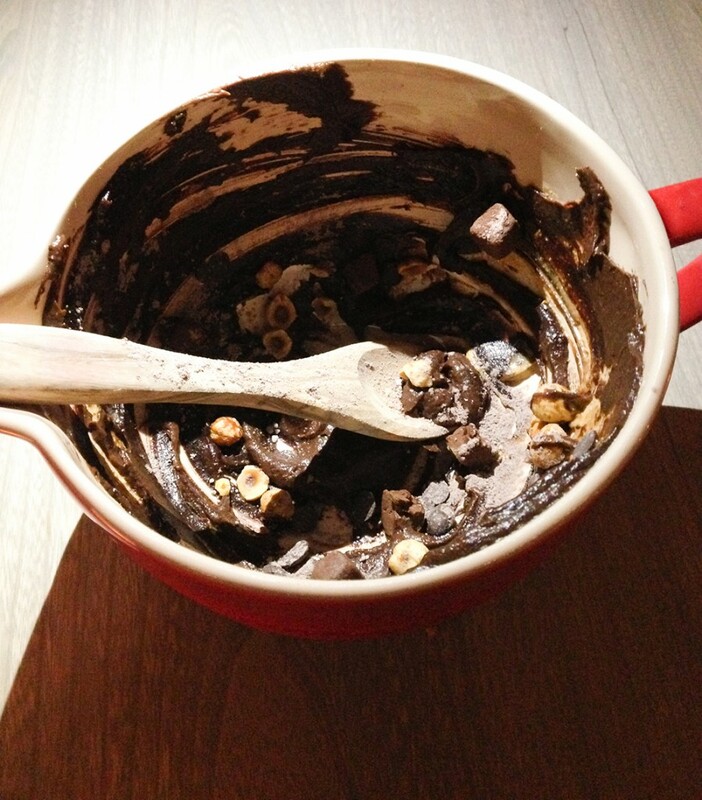 @Myrabev, that is the danger with reading food blogs – no matter what time of day! It is a hazard! holy crap! You gotta place a warning before just throwing pictures of food out like that! I just had a foodgasm. It’s looks so incredible. I need this in my life right now! @Frenchell, I know I often experience the same dilemma when reading other food blogs! ok, i’m wiping the drool off my face. 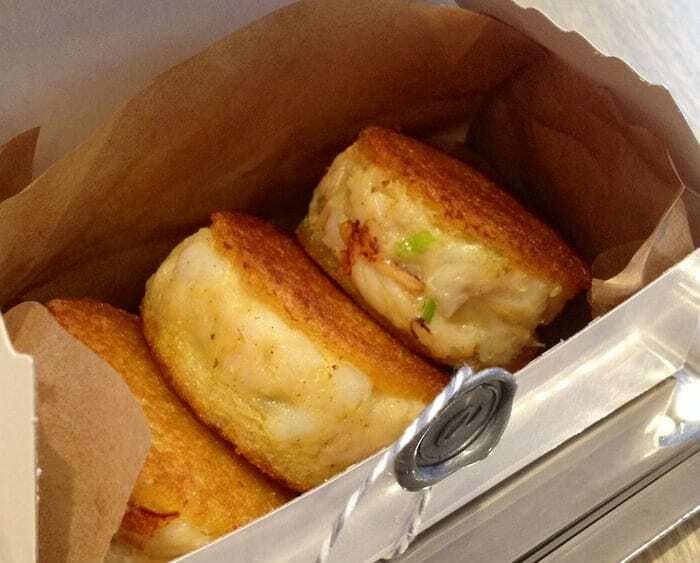 crab macaroons?! sounds soooooooooooo good! @Ruthy, they were outrageously good! Yummy! Those dishes look delicious! Lovely colours in the restaurant! Yum everything looks delicious! What a gorgeous hotel! Kendall, it was and it is beautiful inside! That place is gorgeous and WOW! That food looks AMAZING! food looks really yummy! i’d love to try this place. i feel like food in SF is just so much better than a lot of other cities. it’s also really interesting that one of the dishes uses kimchi powder, and i feel like kimchi is being used a lot lately. @Esther, the food scene is definitely awesome here! And I am noticing a lot of kimchi in many dishes these days! How absolutely beautiful. I can’t even imagine how all of this tasted. @GirlinBeta, it was so good, but I could have made a meal with just the crab cakes! All the food looks absolutely beautiful and I love how the place is furnished! The Goats Milk Custard looks so stunning. What an amazingly talented woman! @Katie, it is a great space and the food is very inventive! Oh my gosh those crab macarons look amazing! Hard to believe that place used to be a convenience store! YUM! This place looks fantastic. Yum! Those crab macaroons look amazing! @Brenda, they were absolutely to die for. You know how awesome crab is in SF! This all looks so wonderful, the place, the menu, the food. Yum! @Jessica, maybe a future date night for you and the hubby! Love Top Chef! The food is making me drool! @Kristine, me too, and it was delicious! OMG!!! Can I have some? This looks freaking awesome and I am typing this while I am starving — so not fair! @Ayana, that happens to me all the time, reading food posts while hungry is definitely dangerous! I love it when people take a little time to develop their brand and product. It is so much more telling of success than an flash in the pan personality (pun intended). Thanks for showcasing! I will be following what she does now! @TheAccidentalMama, I agree, I think it is harder to be patient and purposeful, it is pretty hard though, with media these days, you need to maximize your five minutes of fame because it can quickly distinguish! Wow, all of the food looked so elegant and lovely! I also love Top Chef, and I’m so happy to read this post! I live in the SF area, and can’t wait to go check the restaurant out. Thanks so much for this review! @Michelle, definitely do! 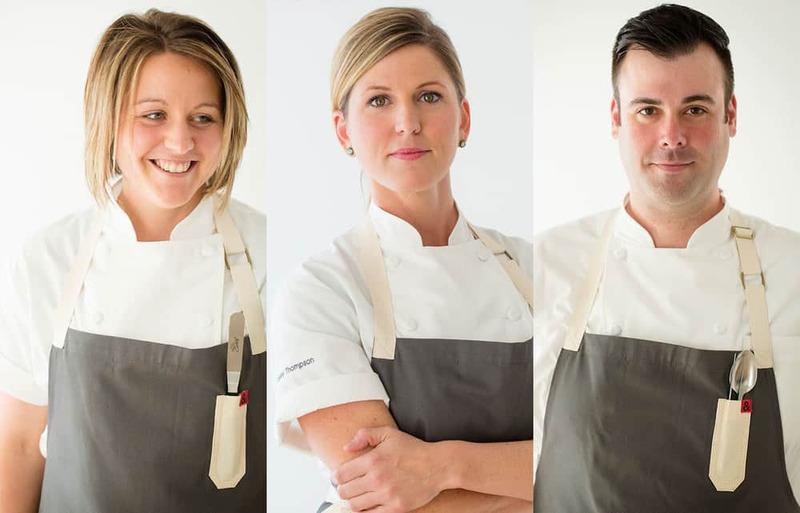 There are a couple of other Top Chef contestants floating around other locations in the Bay Area, we are lucky! Casey was one of my favorite Top Chef contestants too. I’m so glad she’s settled here in the Bay Area. And I have to try those crab macarons! @Anita, they are to die for, seriously still thinking about them! Love Top Chef so maybe a trip to SF is in order. @Astrid, most definitely. We have a couple of Top Chef folks her in the city.